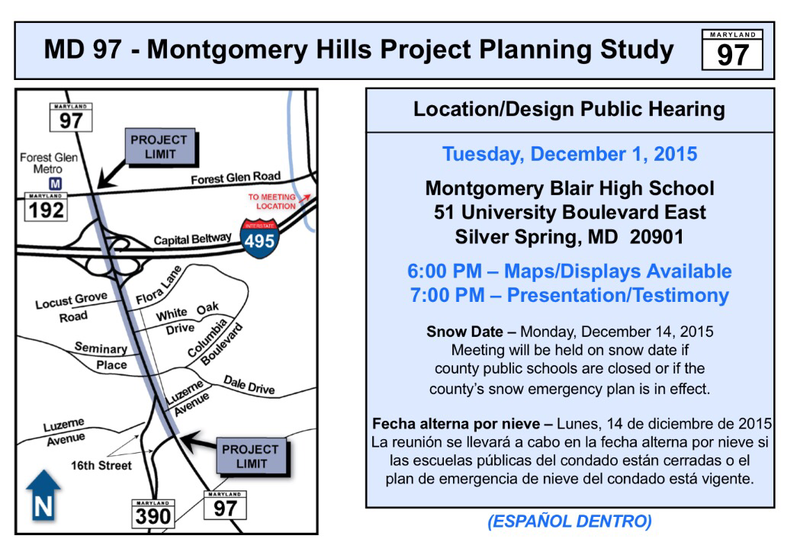 On December 1, 2015, the SHA (State Highway Administration) will be hosting a public hearing where detailed engineering and environmental results will be presented for the Montgomery Hills Project Design. The Montgomery Hills section (the area between Forest Glen on the north-side and 16th street on the south) has been the topic of many redesign conversations over the past several years, including recent news that its master plan will be consolidated with Forest Glen’s own master plan. The initial 10 SHA designs varied from maintaining the status quo to a full fledge tunnel that would go under Georgia Ave. SHA has now narrowed down the selection to 6 designs considered for selection this winter, with design approvals occurring sometime in 2016. Amongst all of the proposed designs for Montgomery Hills, Design 3 will transform Georgia Ave. into a corridor ripe for redevelopment and will create a strong sense of place for the Forest Glen area. Design 3 consists of four travel lanes in the southbound direction at all times and a 16-foot wide grass median that would replace the existing reversible center turn lane. Three travel lanes would be maintained in the northbound direction from 16th street to Seminary Place, and the roadway would be widened to provide four northbound travel lanes from Seminary Place through Forest Glen Road. A new signal at Flora Lane (see above) would also help bicyclists and pedestrians cross Georgia Avenue. Design 3 approaching 16th Street. Georgia Ave. is currently riddled with many intersection issues so Design 3 helps by adding much needed dedicated left-turn lanes at Forest Glen Road, Flora Lane, Seminary Place and Seminary Road. Proposed Left Lane at Forest Glen Rd. Proposed Left Lane at Seminary Road. Design 3 is the only design that allows for trees on both sides of Georgia Avenue and a space where pedestrians and bicyclists can enjoy a wide 13.5-foot-wide sidewalk, providing a significant buffer for pedestrians and bicyclists from the main road. 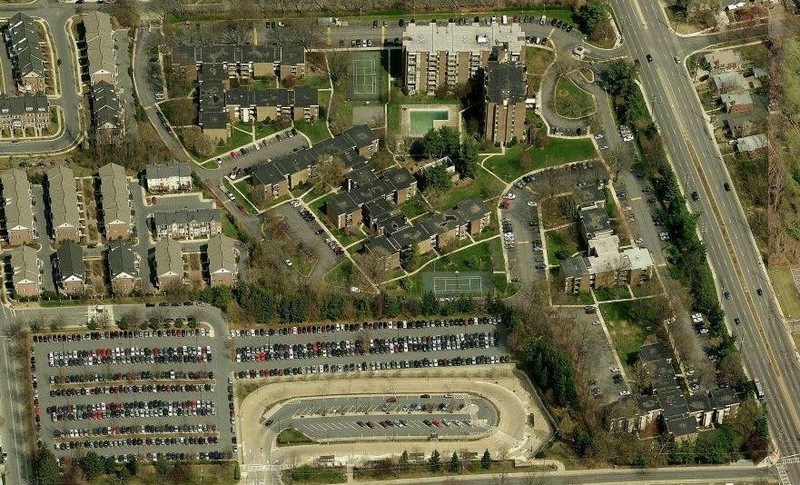 As Montgomery County continues with the Master Plan review, Design 3 is also the only alternative that is consistent with the current M-NCPPC’s North and West Silver Spring Master Plan (adopted in 2000). Although Design 3 does not allow for bicyclist lanes on Georgia Ave, the design does link up with the existing Pedestrian Bridge. With car traffic expected to increase 14.8% in the Seminary Place section (from 73,000 to 84,000) by 2040, Georgia Ave. generally is not a safe road for bicyclists. A tree lined street with an extra wide sidewalk could create a traffic calming effect – making the overall driving and bicycling experience more enjoyable and aesthetically pleasing. 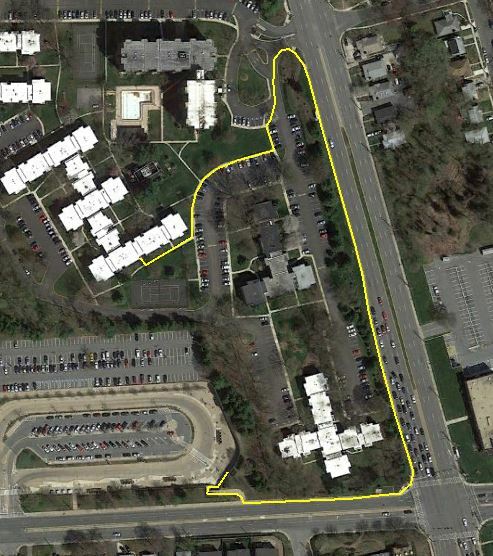 Rhode Island Ave. NW DC between North Capitol and 1st St.
By 2040, Montgomery Hills and Seminary Place could develop into a mixed-use corridor/gateway between downtown Silver Spring and Wheaton. Design 3 not only supports this possibility, but also helps create a sense of place for Forest Glen and Montgomery Hills. Greater Greater Washington covers FG’s fence issue! Time to Tear Down this Fence? Americana Finnmark is a 5 building 316 unit condominium community on 15-acres located right next to the Forest Glen Metro, but there is no direct access to the Metro because of a chain-linked and barb-wired fence. First built in 1967, the Americana Finnmark complex originally included a rather tall 7-story mid-rise building and later was joined by 4 garden styled condo buildings in 1974. Conveniently located on Georgia Avenue right at the intersection of Forest Glen Road before the I-495 ramp, American Finnmark features condos that are competitively priced from the upper $100s and includes a park-like setting with tot lots, a dog run, picnic areas including grills, a large pool, toddler pool, tennis and basketball courts, and ample parking – but no direct access to the Metro despite being just a few hundred feet from the main entrance. Instead, many Americana Finnmark residents are forced to walk around the perimeter of the complex and onto Georgia Avenue before trekking down Forest Glen Road to the Metro entrance. According to above path shown in yellow, residents routinely walk approximately .41 miles or 2,150 feet to get to the Metro entrance. To make matters worse, many residents take a dangerous shortcut as they cross a busy intersection in order to get to the more convenient staircase Metro entrance at Coleridge and Forest Glen Road. Forest Glen Metro’s secondary entrance (staircase) at Coleridge and Forest Glen Rd. 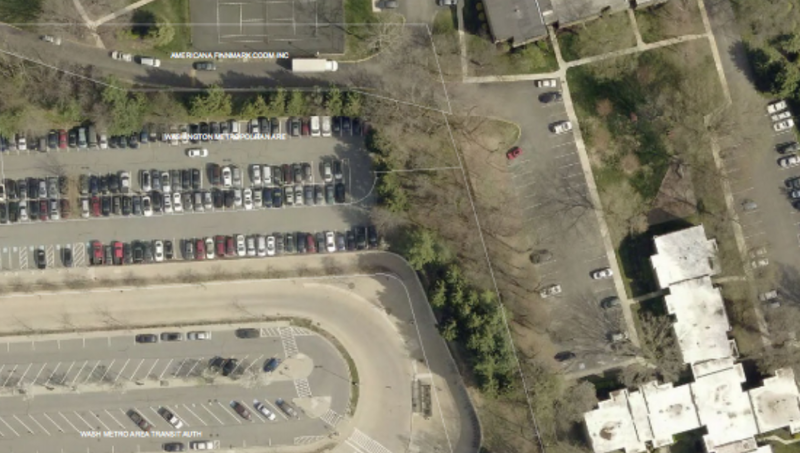 If the fence was removed and WMATA constructed a pedestrian pathway, Americana Finnmark residents would only have to walk a mere .09 miles or 480 feet to get to the Metro entrance and could avoid the shortcut all together. 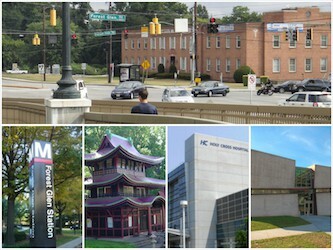 Unlike the Forest Glen Metro station, other suburb Metro stations in the region have large residential and commercial complexes that flow directly into surrounding transit areas. 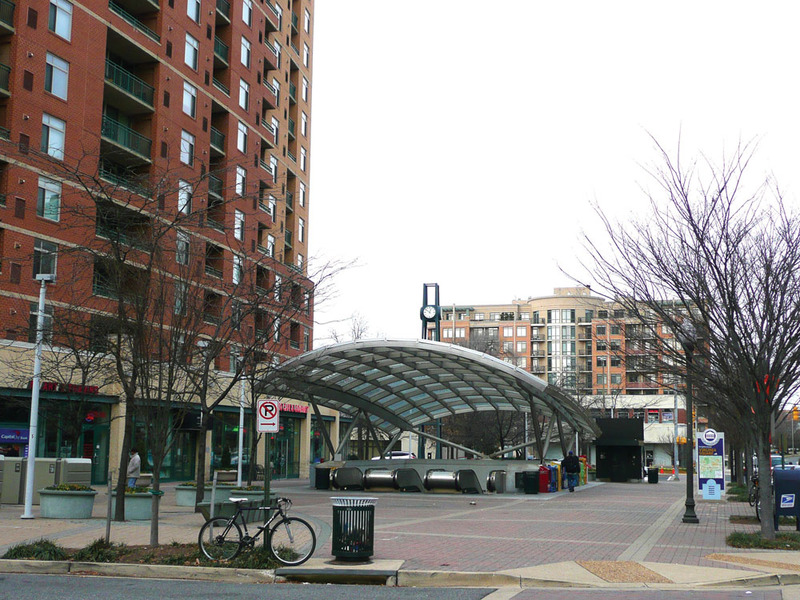 Communities like Virginia Square in Arlington have opened up their apartments and condos to the Metro – creating a natural flow where residences seamlessly integrate into commercial, retail and transit spaces. 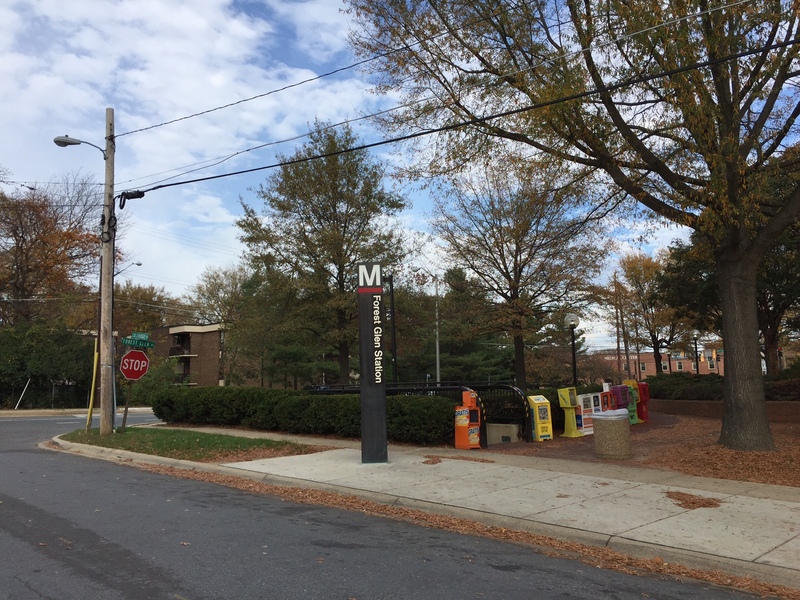 According to land records, WMATA is the owner of the fence separating the station from the Americana Finnmark and it is likely that the fence was erected at a time when Metro stations were largely associated with crime. With the mass exodus of white families from Washington D.C. into the surrounding suburbs, Metro was often looked upon as a vehicle for potential bad actors to conduct illegal activities in the suburbs. Such a fence would have provided a certain level of assurance that properties would be safe from such individuals. Today, the opposite is true, properties close to mass transit are the most desirable in the country. With developers building around metro stations more than ever, now could be the time to revisit the need for such a “security” fence. By removing the barrier, Americana Finnmark’s significant population could not only patronize any new retail at the station, but could take advantage of any other redevelopment that might happen at the Forest Glen Metro. With all of this potential to create a new dynamic space for the community, now should be the time to tear down this fence. Interested in the Georgia Ave redesign? This project covers Georgia Ave from Forest Glen Rd to 16th street so it will affect Forest Glen! Please see the attached flyer and info below for further details. (meeting will be held on snow date if county public schools are closed or if the county’s snow emergency plan is in effect. The purpose of the Location/Design Public Hearing is to formally present the results of the detailed engineering and environmental studies that have been conducted for this project. The public hearing will provide an opportunity for interested individuals, associations, citizen groups, and government agencies to offer spoken and/or written comments for the project record before an alternative is selected. Maps and other exhibits depicting the study’s alternatives and other information will be on display for public viewing, beginning at 6:00 p.m. Representatives from SHA, Montgomery County, and FHWA will be available to answer project-related questions and receive comments. A formal presentation lasting approximately 30 minutes will begin at 7:00 p.m. and will be followed by public testimony.